Washington (CNN) – With odds of purchasing the winning Powerball ticket set at 1 in 175,223,510 – longer odds than dying from a bee sting or being struck by lighting – it shouldn’t be shocking that lotto hopefuls are turning to God for some divine intervention in advance of Wednesday night’s drawing for a $550 million jackpot. “Because WE Are STRONGER When WE Are CONNECTED,” the website says. Around 20 people have bought in, their names scrawled across the bottom of the site. But the idea of praying for something so selfish has raised some eyebrows. Many on Twitter are asking the simple question: Is it OK that I ask God to make my lottery ticket a winner? Can you pray to win the Lotto? Or is that like sinning? So, are such prayers really OK? “Sure, but it is complicated,” said Tanya Luhrmann, a Stanford University anthropology professor who wrote the book “When God Talks Back,” about the use of prayer. In doing research for her book, Luhrmann spoke with hundreds of Christians about why and how they pray. Some conversations centered on what she called prayer for “trivial things” – a good haircut, a parking spot or the answers to an exam. Others, however, derided those prayers as beneath God. For Rabbi Felipe Goodman of Temple Beth Sholom in Las Vegas, whether it is acceptable to pray for a winning lottery ticket boils down to whether you believe people will do good things with that money. “Who are we to qualify whether or not this is trivial,” Goodman said. Like those who have come to the rabbi’s synagogue, many on Twitter have looked to God for a lottery win. If i were to hit powerball lotto, my family and friends would be taken care of. Tomorrow could be that day...pray for me. This practice isn’t unheard of. In the past, lottery winners have credited prayer with their financial windfalls. In 2007, after Gloria Aguda won $9 million from the Colorado Lottery, she told the Denver Post that when her house was about to be foreclosed upon, she prayed for help and bought a lottery ticket. Religion and the lottery have long been connected, primarily because religious leaders from many denominations have protested allowing lotteries in their states. For example, when South Carolina voters decided to repeal a constitutional amendment and allow the state to hold a lottery in the year 2000, religious voices from the largely evangelical state voiced disapproval. 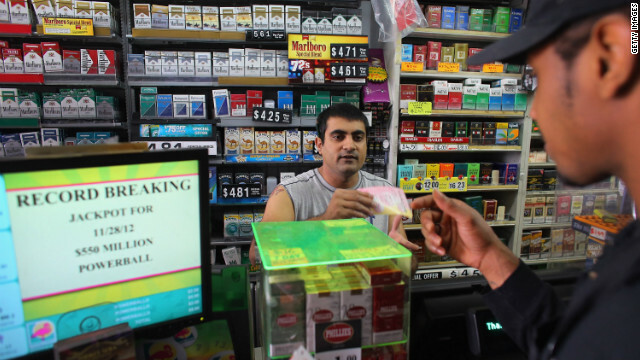 Earlier this year, Texas Baptists asked the state’s lottery commission to totally abolish the state lottery, arguing that it takes advantage of the poor and caters to impulse buyers.